For some kids, puzzles can be challenging. 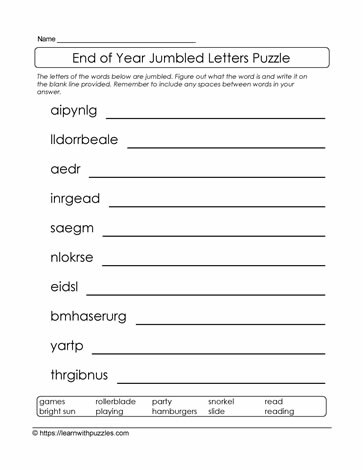 Start them off with a jumbled letters puzzle that give support by providing a list of end of school year words in a word bank. Kids need to unscramble the letters in each question. Use the word bank as support. For example: If there is a long string of letters, then look for clues that have more than one word. The longer the string of letters, the greater the chance that the answer is more than one or two words.